In this article, I bring you ten of my favorite tmux tips. For those unfamiliar with tmux, SitePoint Ruby Editor Glenn Goodrich has written an excellent overview of the basics. Today, I am going to show you the tips and tricks I use with tmux on a daily basis, as well as how tmux can improve the workflow of your Ruby development. If you are a vim user, you will be in for a treat. Getting into a new habit is always an uphill battle. Just like trying to force myself into using the hjkl keys in vim by disabling the arrow keys, I needed to find a way to force myself to use tmux all the time. This is useful when you are in the middle of coding and you forgot that you should have tmux-ed in the first place. The above example works with iTerm2 on Mac OSX. It shouldn’t be difficult to search for Linux equivalents. The main idea is to always run tmux attach -t base || tmux new -s base when the terminal program starts up. The line above attempts to connect to a previously created session called base, or creates a new one (also called base) if it doesn’t exist. You can rename base to anything you want, it is not a special keyword. With this incantation, whenever you fire up the terminal, you will automatically connect back to your previous tmux session. Obviously, this demonstration is a mere party trick to impress developers and nothing more. A good use case is having to perform a repetitive operation on multiple machines. For example, imagine having a tmux session connected to four remote hosts and having to executer the exact same command on all of them. This tells tmux to source the configuration again, essentially reloading tmux. This is a recent discovery of mine. I didn’t realize someone had created a tmux plugin manager. I won’t bore you with the details of installation, since it is pretty straightforward. Once you get the plugin installed, it’s only a matter of selecting the plugin you want and pasting the entry into tmux.conf. The next two tips cover two interesting plugins that can be installed with the tmux plugin manager. tmux-resurrect is a tool to persist a tmux environment across system restarts. Why is this useful? When you restart tmux, your entire tmux session is gone. tmux-resurrect fixes that. Another very nice feature of tmux-resurrect is the ability to restore vim sessions too! In the video that follows, I have a vim session in the left pane rails console and rails server, respectively, on the right. First of all, we have to tell vim-obsession to track the session. I also have htop running in another window. In order to save an entire tmux session, type prefix + Control + s. Then if something kills the tmux server, which is what happens when your battery runs out or when someone trips over the wire and the power gets cut. With tmux-resurrect, losing your tmux session is not an issue. In order to restore the session, you need to run tmux again, and this time, hit prefix + Control + r.
However, I can already here some people thinking, “Isn’t manually doing prefix + Control + s + r is a hassle! Who has time to remember all that?” Enter tip #6.
tmux-continuum continuously saves your tmux environment at regular intervals and automatically restores it when tmux is started. Zoom was introduced in tmux 1.8. tmux zooming is very useful when you want to look at test failures or inspect logs. To zoom into a pane, hit prefix + z, and use the same combination to zoom out. It can sometimes be confusing to figure out whether you are in a vim split or in a tmux pane. Navigating between both is also a hassle. That is until vim-tmux-navigator came along. Here, we have a tmux session with three panes. 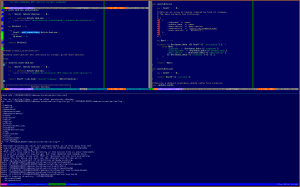 The left half consists of two vim splits, and the right hand side contains two tmux panes. We have the specs for a Micropost model. I have configured to runs all the specs found in this file. However, when I hit , it runs only the specs under the cursor. Extremely handy! In addition to having an awesome name, tmuxinator is an excellent Ruby gem that helps you create an manage tmux sessions easily. tmuxinator is especially useful when you have different projects requiring different layouts of panes/windows. I hope you enjoyed this article, and learned something new. Do you have other tips to share? Spread some tmux love in the comments below!